The Naked Truth returns with a roundhouse kick to the brain, squaring off against Fonda Lee’s brilliant Jade City with three “+’s” and “Δ’s” in a review that will leave some readers with the Itches. The story is about a crime family in an alternative history of 1950’s Japan, except in this timeline, the ornamental green rock imbues certain native “Kekonese” people with magical fighting powers. While this story sounds a little bizarre, let me lay everything on the line here: this is the best new book I’ve read in years. Lee has conjured up a fictive dream that dunks the reader’s head underwater and won’t let them up for air. It’s been a long time since I’ve lost sleep because of a book (The Last Unicorn was the previous one which kept me up all night), but this novel compels the reader not to put it down. The mixture of action, intrigue, dynamic characters and overall fun keep the pages turning, and while the story has a few spots that made me scratch my head, they weren’t enough to detract from the illusion of this fictional world. It’s extremely well done. However, as per usual with the TNT, we’ll pretend this book has arrived in our author’s critique group—where nothing is sacred. The story machine in this book really cranks. Most lines have a three-fold attack, layering in details about the setting, plot, and characters all in a single sentence. Lee has just the right touch for this and knows when one scene or character has become boring, then she shifts gears. This results in the story playing out like a TV or anime series (at least in my head), something similar to Kill Bill mixed with Samurai Champloo. + Finally, fight scenes I care about! Lee first came to my attention with the excellent work Zeroboxer, a cross-genre piece involving an athlete in space. But while Zeroboxer’s pacing eventually fell flat, Jade City never loses its momentum. Each fight scene ramps up from the last one, and the introduction of the magical jade fighting abilities make them much more interesting to read than your standard martial arts sequences. The mechanics are done so well they could almost serve as the basis of a cool videogame or DND-style adventure game. Revealing mysteries one at a time keeps the reader off balance in the best kind of way. Without giving away any spoilers, let’s just say that there are a couple twists and turns that you won’t see coming, and this novel becomes a real page-turner. Chapter 3 ends by wrapping up the action from the first chapter, then we have to slog through a few exposition-heavy sections before we get back to more interesting fare with Andy in chapter 7. While Lee has to do the groundwork here to introduce her extra characters, I felt this was the slowest part of the book. Perhaps she had to dial down in order for her readers to care about her characters, but there may have been another way to approach these scenes in order to make them more exciting if she would have poked around a bit more and explored how else this could have been done. Δ Alternative history is such an odd genre. Was it necessary for this story? relayball = soccerish-polo thing? This sport is still unclear to me. The nuances of “alternative history” baffle me. PKD’s The Man in the High Castle is one of my favorites in this genre, and his world makes sense to me because its still “our world” but in a different timeline (one where the Axis won WW2). Similarly, Zelazny’s Chronicles of Amber works just fine because the author explains how all the reality shifting functions, explaining how Corwin’s world is adjacent to ours. In Lee’s universe, however, the island of Kekon is entirely different than Japan, yet has a similar Shinto-inspired religion, “Green Bones” as magical Yakuza, and food/clothing/buildings that are direct copies of Japanese culture. This mixture results in a bizarre melding of real and not-real which makes me disassociate between what exists in our world and what’s been replaced with the “fake” world of Jade City. How does the author decide what to “copy” from our universe and what needs to be created from her own imagination? It’s a weird process to think about, and I wonder how different the story would be if she had only made jade a “secret ability” in Japan and kept everything in “our” world rather than creating this ersatz island of Kekon and this entire other-Earth. Lee wrapped up the ending decently (the last fight was a bit cheesy, but I’ll let it go because some of the earlier ones were awesome). However, that word “Saga” on the front cover makes my blood boil. Obviously, publishers like multiple books in a series for sales, and the author has spent a long time building this world and they want to get the most bang for their buck, so the story will continue on…perpetually? Don’t get me wrong—I loved this book. But will I be paying attention to the release date of Jade Warriors or Jade Families or whatever the hell the next one will be called? Read this book once for the sheer joy of it. Then read it again and look closely how Lee crafted her chapters, scenes, paragraphs, and sentences. If you can replicate this quality of writing, you can publish your own story no matter what it’s about. Congratulations Fonda—I’ve never met you, but this is a hell of as novel. If we ended up facing off against one another in Writer Vs Writer combat, I’m sure you’d take all of my jade. 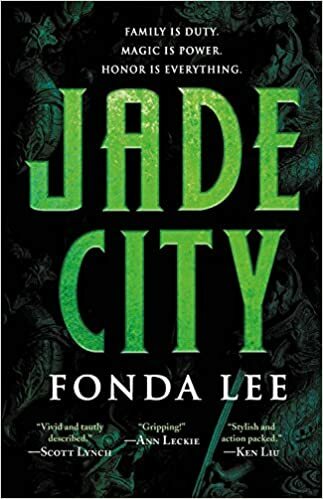 Tags: fonda lee, jade city, the naked truth. Bookmark the permalink.